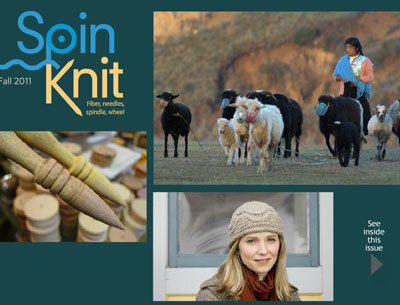 Welcome to SpinKnit 2011 from Interweave! Look at the cover! Spindle, plus sheep equals hat! Love. It! Well, we all know there’s more to it, that’s why the folks at Interweave bring us these mouth watering magazines! In this issue articles discuss traditional textiles (cedar fibers) from the Pacific Northwest (Forks, WA to be specific – sound familiar, Twilight fans?) and Mexico, the science and skill that go into creating beautiful, yet functional spindles, sheep that are double coated and subsist on seaweek (yes, really! ), and a spinning technique called “tail spinning”. Patterns too! I love these books, even the ads are enticing. And, since it’s an EMag, it’s totally interactive. Click on the links that give you videos and slideshows on spinning trees into yarn. 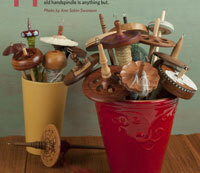 And I’m pretty sure that if this pail of spindles arrived at my house I’d think I died and went to heaven! I just love reading about the rare sheep breeds, you know the ones, they take what little food they can find and turn it into the most exquisite fleece imaginable, and the shepherds and shepherdesses who tend these flocks, where they are, how they live, it’s all in here, and great reading. And then when you think you’ve extracted every ounce of yummy goodness out of this emag, there’s the video at the end. Watch the lamb races, and the poor sheep mothers who have to try to keep up with them. Cute! Available as a digital download for both PC and Mac, you HAVE to see this one!